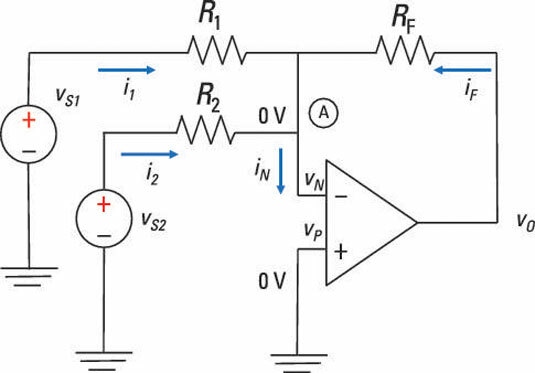 You can extend an inverting amplifier to more than one input to form a summer, or summing amplifier. An inverting amplifier takes an input signal and turns it upside down at the op amp output. Here is an inverting op amp with two inputs. The two inputs connected at Node A (called a summing point) are connected to an inverting terminal. The output voltage is a weighted sum of the two input voltages. The ratios of the feedback resistance to the input resistances determine the gains, G1 and G2, for this op amp configuration. This shows that the output is proportional to the sum of the two inputs. You can easily extend the summer to more than two inputs. The signals are bigger — mission accomplished. If signals are changing in time, the summer adds these signals instantly with no problem.